This article was published on September 11, 2018 on Beckers Hospital Review written by Megan Knowles. Forty-four million people, or 13 percent of Americans, live in a county with a primary care physician shortage, defined as less than one primary care physician per 2,000 people, according to a report from UnitedHealth Group. UnitedHealth Group, one of the largest U.S. insurers, analyzed gaps in primary care access, primary care demand and the value of advanced practice clinicians, including nurse practitioners and physician assistants. 1. Americans in rural areas are nearly five times as likely to live in a county with a primary care physician shortage compared to urban and suburban Americans — 38 percent compared to 8 percent. 2. But almost as many urban and suburban residents live in a county with a primary care physician shortage as rural residents (21 million vs. 23 million). 3. 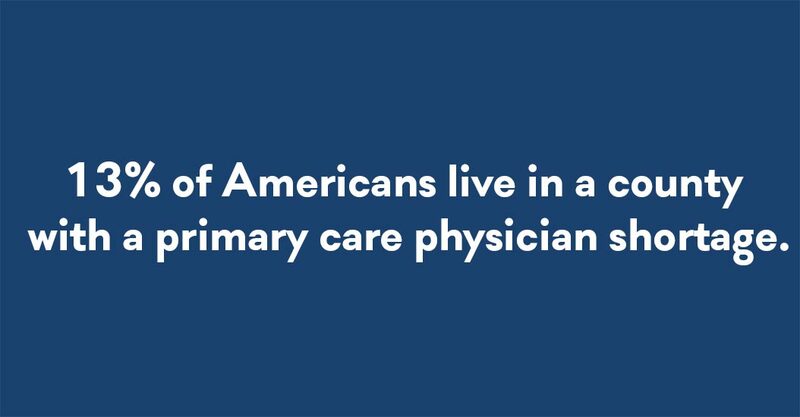 Only 33 percent of active U.S. physicians practice primary care (288,000 out of 869,000), meaning the supply of primary care physicians will continue to be insufficient to meet population demand, UnitedHealth Group says. 4. The estimated primary care physician shortage could increase from 18,000 in 2018 to 49,000 by 2030, the report found. 5. UnitedHealth Group highlighted the opportunity to increase primary care capacity by expanding the scope of practice for nurse practitioners. In 22 states, NPs can do everything their medical training allows, but 28 states restrict the services NPs can provide. “Allowing NPs to practice to the full extent of their education and training represents a meaningful, timely opportunity to increase primary care capacity in the U.S,” United says.